V-Count Attends Industry Events Around the World! No Comments on V-Count Attends Industry Events Around the World! The company exhibited its solutions at the Khalifa Fund Innovation event in Abu Dhabi on October 24th, and Kjøpesenterkonferansen in Oslo held on October 17-19th. Our CEO Demirhan Büyüközcü was one of the panelists of “How Digital Innovation Leads Retail” panel at RECon MENA 2018 and shared his experiences on developing technologies. V-Count was a Silver Sponsor at the event. Additionally, our team attended international retail real estate event MAPIC in Cannes on November 14-15th. Our next stops will be SEAMLESS Dubai 2019 on April 10-12th and RTBE London 2019 on May 01-02nd. 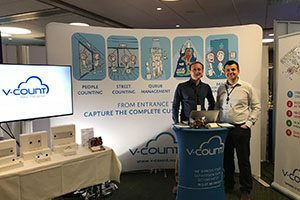 Please connect us through [email protected] to book a meeting and let’s start discussing about how V-Count solutions will increase your profits.